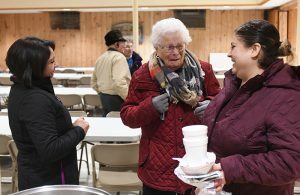 Jan. 22 was a typical Tuesday night Mass at St. Mary of Mount Carmel Church in Long Prairie. As usual, about 40 to 50 people attended, praying the rosary together before Mass began. What marked the occasion as special was the celebration that followed. Just days before the Mass, parishioner Margarita Cervantes and her husband, Marco, were visiting with St. Mary’s pastor, Father Omar Guanchez. Margarita noted how the community has changed over the last 20 years. Margarita wanted to do something special to celebrate and honor those who have made the community one. “The Holy Trinity is a community — the Father, Son and Holy Spirit. It is important to me and to our family to build community together. My children were born here, they are Mexican-Americans. They are part of this community and part of this country and we need to build a community of support for one another,” Margarita said. She reached out to others from her Hispanic prayer group and invited them to bring treats to share after the Tuesday night Mass. St. Mary’s is comprised of about 650 total households; about 20 percent are Hispanic/Latino families. On weekends, there are Masses in both English and Spanish. During the week, both English- and Spanish-speaking parishioners attend the Tuesday evening Mass and Father Guanchez incorporates both languages into the liturgy. Elizabeth Montanez, who attends St. Mary’s with her husband, Jose Cisneros, said when her father came to Long Prairie over 20 years ago, he sometimes felt unwelcome. “He felt that people didn’t like us. They looked at us strangely,” she said. “Now everyone says hi, everyone feels welcome,” Cisneros added. Nalezny, along with longtime St. Mary’s parishioners Betty Schenk and Marilyn Zastrow, stayed after Mass and enjoyed the treats made by the Hispanic parishioners, including “galletas,” cookies with cinnamon and sugar; flan, a Mexican dessert made with milk and eggs and covered in caramel; “leche de arroz,” a warm rice milk beverage; Mexican hot chocolate; and Jello. Nalezny appreciates the devotion the Hispanic community brings to the parish. “There are almost always fresh flowers at the shrine of Our Lady of Guadalupe. That shows dedication. That is something that not all of us people of German, Polish heritage do,” he said. 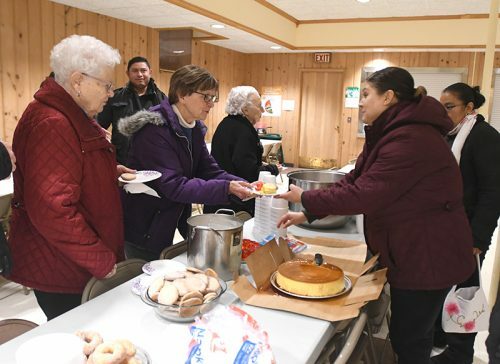 Another example of the way the community has a blending of cultures is through their annual Knights of Columbus “fish taco fundraiser” during Lent, planned this year for March 8 from 5 p.m. to 8 p.m. The Hispanic community has also begun participating in the summer parish festival, offering a taste of traditional fare at the food stands. Father Guanchez added that having an adoration chapel also has been instrumental in uniting the community.